Bishop and Torres raz McGee over a typo they found in one of his briefs before Gibbs rounds up everyone for a murder. The "baby faced kid" was seemingly attacked by a bear. Tessie thinks its the worst death she's seen so far, but Palmer doesn't trust the bear attack story. Meanwhile, his father-in-law Ed arrives to take him to lunch. Ed wants Palmer to lie about his findings. When Gibbs arrives, he does just that but immediately regrets it. Ed's reason isn't exactly a barn-burner. It's something to do with gambling and $50k that he lost to a guy named Peter, who asked for a favor. Oh! The favor was to do something with the kid's dead body. He faked a bear attack because he knew that the kid, being Navy, would eventually end up on Palmer's table. 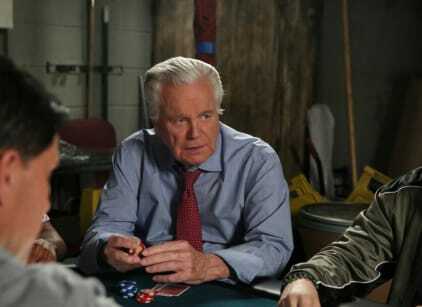 Palmer stops Ed's description of the poker group because he mentions Old Man DiNozzo. Palmer decides to reach out to Senior to see if he can help. The trio has a chat about crap. Ducky rolls into the morgue just at the time Palmer is ready to dig into bear kid. Palmer freaks out since he knows that Gibbs knows. Palmer, Senior, and Ed chat about Ed's' poor luck and Peter's bad poker playing, but Senior doesn't think Peter is a killer because he's a bad poker player. Stevie, Ed's son, is now a hostage of Peter as payment for Ed's bang-up job getting rid of the Navy kid. Palmer regrets what he has to do next, and that can only mean he's going to give Gibbs the lowdown. Logan was a hellcat as a teen, but he had really turned it around when he entered the Navy. While Gibbs and the other lady are talking to the father, Palmer steps in and asks for a minute. Gibbs takes Palmer into an interrogation room to get the truth. Palmer lets the entire ridiculous tale roll off of his tongue. Palmer wants to plea insanity under intense familial pressure. Gibbs is disappointed in Palmer, but he doesn't seem to be gunning for his job. He doesn't want him to ever lie again because without trust, they have nothing. When they get to the cleaners, Peter Lu is dead on the floor. So much for Mister Big. Palmer wonders if Stevie could have done something. Ed says no way, but Palmer suggests all of his past behavior might have gotten him into trouble. And it's true. Ed reveals the gambling debts weren't his but Stevie's. Some dude named Kenny ran the big name and said he'd get them out of debt right after they got him out of debt. So where does Peter fit in? He's just a debt schmuck? Ed thinks Palmer was born into the world unencumbered, but Palmer lost his dad at age 10. Dad was not a good man, and Palmer only forgave him when his daughter was born. He has two great father figures at NCIS, but he keeps holding out hope that Ed might show up for him one day as an actual dad. "The" Henry Deng backrolled all of Peter Lu's dry cleaning shops. He's a big tech guy and one of the richest men in Singapore. Ducky shares with Senior that he's perhaps doing his last autopsy ever. Senior will never concede it's late in life. Ducky doesn't think there is a place for him anymore. Palmer overhears and admits bringing shame onto their profession. It turns into a mutual admiration society. Kion Deng is Kenny Dent. The father is the guy from that Syfy show about frozen people, so he's going to play a role in the story. Sloane goes undercover with Torres to the poker game, but it doesn't go down and they pull out their badges instead. Palmer comes into the office bearing bear claws and danishes as apologies to everyone. He has tied the two murders together, but he can tie nothing to Kenny Deng. Ed confronts Henry about their terrible fathering skills, ultimately begging Henry about Stevie's health. He also assures Palmer that he's always wanted Stevie to be like him. Kenny has Stevie in a boat, and the rescue is relatively easy. Henry tells his son he didn't betray him because he's holding him accountable at long last. Stevie runs out of the boat and into Palmer's arms. Palmer says it was his day, and dad says it was Palmer. Hugs all around. Ducky shares his news about leaving with Gibbs. Ed: This was a bear. Ed: Say it was a bear, please. I promise you, Jimmy, it's a matter of life and death. Call it a bear, please. Bishop: I swear, McGee, your case summaries read more like a good book. McGee: Thank you. I try to do more than just the backspin. Bishop: This one is a real page-turner -- it's got mood, intrigue, emotion. Torres: And a typo. Either that or you misspelled a word. Either way, I caught it. McGee: Which word is that? Torres: Weather. As in, "Our agents did the best to weather the storm." Bishop: I see it! You spelled it "w h" as in "whether or not." Torres: When, in fact, it should be "w e" as in, "how's the weather?" McGee: Or as in, "I doubt whether anyone would care either way." Torres: I care. Am I just anyone? Bishop: And there is a third way, "w e th" as in bellwether, as in castrated ram. McGee: Why would anyone say "we'll castrated ram this storm?" Bishop: I'm just pointing out the nuances of the English language. Permalink: I'm just pointing out the nuances of the English language.